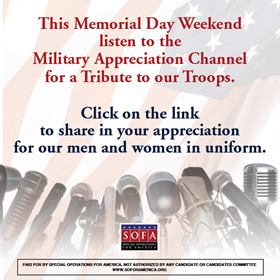 Military Appreciation Channel - Tune in! 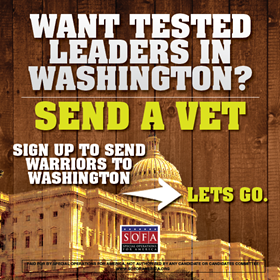 Special Operations for America (SOFA) endorsed Joni Ernst for US Senate from Iowa, citing her strong conservative record and service as a lieutenant colonel in the Army National Guard. "Joni Ernst exemplifies the service and sacrifice we look for in our public leaders. She's a mom and a grandmom, but she's also a citizen-soldier who understands what it means to wear the nation's uniform," said Gary Stubblefield, a former Navy SEAL and chairman of SOFA PAC. "She bravely served during Operation Iraqi Freedom running convoys through Kuwait and into southern Iraq. She knows how important it is to our nation's security to have a strong military." Ernst is facing four opponents in the June 3 Republican primary. Stubblefield said that aside from Ernst's military service, she has a strong conservative record in defense of life, traditional marriage and the Second Amendment. "Joni Ernst would be a terrific addition to the U.S. Senate as a voice for a strong national defense and in support of traditional values," said Stubblefield. 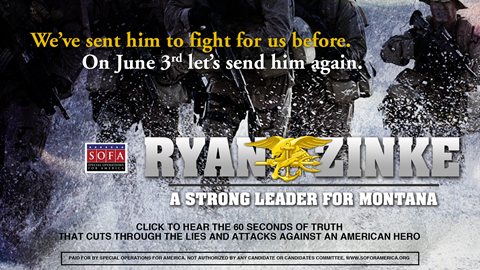 Click to hear the 60 seconds of #truth that cuts through the lies and attacks against an American hero. Click here to see the gif.